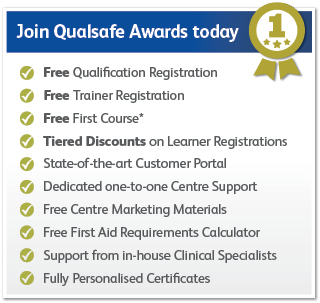 Qualsafe Awards is an Awarding Organisation regulated by Ofqual, CCEA and Qualifications Wales. “Contract” means the contract between Qualsafe Awards and the Centre in respect of the supply of Centre Services, formed by Qualsafe Awards’ acceptance of the Centre’s Application (which, however made or communicated, shall be deemed given subject to these Conditions). 2.1 The Contract shall be deemed to have been entered into when Qualsafe Awards’ confirms that the Centre has been granted approval. All Centre Services are supplied subject to these Centre Terms and Conditions and theCentre Agreement. These Centre Terms and Conditions and the Centre Agreement shall be the sole terms and conditions applicable to the provision of the Centre Services. Terms and Conditions on the Centre’s order form or other similar document shall not be binding on Qualsafe Awards and the submission of an Application by the Centre shall indicate unqualified acceptance of the Centre Terms and Conditions and the content of the Centre Agreement. 2.2 No representative, agent or other person has Qualsafe Awards’ authority to vary, amend or waive any of these Terms and Conditions on behalf of Qualsafe Awards. The Centre should contact Qualsafe Awards should it require to vary, amend or waive any of these terms and conditions and no change to these Terms and Conditions will be deemed to have been accepted unless formal confirmation is received in writing from a Director of Qualsafe Awards. 3.1 In consideration of the Centre paying Qualsafe Awards the relevant Fees, Qualsafe Awards agrees to provide the Centre Services to the Centre in accordance with these Terms and Conditions. c) use reasonable endeavours to maintain its regulatory approval (including, without limitation, its Ofqual approval). 3.3 Subject to Condition 6, where the Centre is awarded Approved status, Qualsafe Awards shall supply the relevant Qualsafe Awards Materials to the Centre as relate to such Approved status and enable the Centre to deliver the qualifications that it is approved to deliver. 3.4 The Centre acknowledges and agrees that Qualsafe Awards’ ability to provide the Centre Services is dependent on the full and timely cooperation of the Centre. b) any time for performance of any such obligation shall be reasonably extended by the period of such prevention or delay. 3.6 The Centre accepts that the adherence to advertised timescales for, and the standard of, Centre Services provided by Qualsafe Awards may occasionally vary and by submitting an Application, the Centre acknowledges acceptance of such. 4.1 The Centre acknowledges and agrees that Qualsafe Awards is under no obligation to award the Centre Approved status, including without limitation in respect of a specific course. Approved status shall be granted by Qualsafe Awards in its absolute discretion. 4.2 As part of the Centre Services the Centre shall be required to ensure that its activity and/or that of its staff (including Trainers, Assesors and Internal Quality Assurers) do not do anything which brings, or in which in Qualsafe Awards’ reasonable opinion could bring, the Centre and/or Qualsafe Awards’ reputation into disrepute. f) purchase £475.00 worth of Qualsafe Awards Qualifications within the period commencing the delivery of its first Qualsafe Awards Qualification and in each 12 month period thereafter during the term of this Agreement (the “Minimum Purchases”). If the Centre fails to purchase the Minimum Purchases in any relevant 12 month period Qualsafe Awards shall be entitled to charge the Centre such additional reasonable Fees as it may determine its sole discretion. For the avoidance of doubt, the Centre shall not be entitled to roll-over Minimum Purchases in excess of £475.00 from one 12 month period to another. 4.4 The Centre shall indemnify Qualsafe Awards and keep it fully indemnified in respect of any loss, cost, claim, damages and/or expense incurred by Qualsafe Awards in connection with any breach of Section 15.1 and 15.2 of theCentre Agreement by the Centre and/or any of the Centre’s employees, agents or other representatives (including without limitation its Trainers, Assessors and Internal Quality Assurers), in whole or in part. 4.5 The Centre acknowledges and agrees that it shall be the Centre’s responsibility to verify the validity and accuracy of any and all information, qualifications and other materials provided by a Trainer, Assessor and/or Internal Quality Assurer prior to providing such to Qualsafe Awards. 4.7 Where key dates and/or milestones are agreed between the parties in writing in advance, if the Centre becomes aware that it is unable to meet or is likely to be unable to meet any one or more of such key dates, it shall notify Qualsafe Awards as soon as reasonably practicable stating the reasons for such delay. 5.1 Subject to Condition 5.2 below and/or earlier termination in accordance with these Conditions, where the Centre is granted Approved status, the Centre shall retain its Approved status provided it complies with the on-going requirements detailed in Section 15.1 of the Centre Agreement. b) not at any time advertise, operate or otherwise offer any Qualification to a third party until the Centre has received and only during the period the Centre maintains Approved status in respect of such specific Qualification. 5.4 The Centre shall indemnify Qualsafe Awards and keep it fully indemnified in respect of any loss, cost, claim, damages and/or expenses incurred by Qualsafe Awards in connection with any breach of Condition 5.2 by the Centre and/or any of the Centre’s employees, agents or other representatives (including without limitation Trainers, Assessors and Internal Quality Assurers), in whole or in part. 6.1 Subject to Conditions 6.2(a), 6.2(c) and Condition 8 below, where the Centre receives Approved status in respect of a Qualification, Qualsafe Awards permits the Centre’s Approved Trainers and/or Assessors, as applicable, use of the Qualsafe Awards Materials when delivering the Qualification to third parties. g) shall immediately notify Qualsafe Awards of any unauthorised access or use of the Qualsafe Awards Materials, including without limitation, assessment paperwork. 6.3 The Centre shall indemnify Qualsafe Awards and keep it fully indemnified in respect of any loss, cost, claim, damages and/or expenses incurred by Qualsafe Awards in connection with any breach of Condition 6.2 by the Centre and/or the Centre’s employees, agents and other representatives (including Trainers and/or Assessors), in whole or in part. 7.1 The Centre shall pay Qualsafe Awards the Fees. Published Fees are exclusive of VAT. b) Qualsafe Awards shall be entitled to charge additional Fees in respect of the supply of Centre Services, as detailed on the Qualsafe Awards website, including but not limited to charges for printing of Certificates, audits, External Quality Assurance visits and amendments to Certificates. 7.3 Time of payment shall be of the essence of the Contract. c) revoke the Centre’s Approved status, in whole or in part, on either a temporary or permanent basis. 7.5 No payment shall be deemed to have been received until Qualsafe Awards has received the Fees in cleared funds. 7.6 All payments payable to Qualsafe Awards under the Contract shall become due immediately on its termination despite any other provision. 7.7 The Centre shall make all payments due under the Contract in full without any deduction whether by set-off, counterclaim, discount, abatement or otherwise. b) at any time, subject to notifying the Centre in advance. 8.1 The Centre acknowledges that any and all Intellectual Property in and relating to the Qualsafe Awards, Qualsafe Awards’ business and/or the Qualsafe Awards Materials belong solely to Qualsafe Awards and shall remain entirely in the ownership of Qualsafe Awards. Nothing said or done by either party shall constitute the transfer of any such rights. 8.2 Subject to Condition 8.1 above and Conditions 8.5 and 8.6 below, where the Centre obtains Approved status Qualsafe Awards hereby grants the Centre a non-exclusive, revocable, royalty free licence to use the Qualsafe Awards Centre Logo for the duration of the Contract strictly for the purpose of delivering the Qualifications (such permitted use to include using the logo on any letterhead, marketing and promotional materials or the Centre’s website but not on any Certificate). The Centre shall provide Qualsafe Awards with copies of any materials containing the Qualsafe Awards Centre Logo and any other materials referring to Qualsafe Awards on request. For the avoidance of doubt, nothing in this Condition 8.2 shall permit the Centre to use any logo or trademark of Qualsafe Awards’ other than the Qualsafe Awards Centre Logo. 8.3 The Centre hereby grants Qualsafe Awards a non-exclusive, royalty-free licence to use the Centre’s name, logos, trademarks and other Intellectual Property (the “Centre IP”), for the duration of the Contract for any purpose, including without limitation for the purpose of Qualsafe Awards applying the Centre’s name to Certificates. 8.4 The Centre shall indemnify Qualsafe Awards and keep it fully indemnified in respect of any loss, cost, claim, damages and/or expenses incurred by Qualsafe Awards in connection with its use of the Centre IP, in whole or in part. 8.5 On termination of the Contract for any reason, the Centre shall return to Qualsafe Awards (or at Qualsafe Awards’ request, destroy) all copies of Qualsafe Awards Materials, shall ensure that any copies of the Qualsafe Awards Materials on hard discs or other storage means associated with any computer equipment owned or controlled by the Centre are permanently deleted and shall immediately cease to use the Qualsafe Awards Centre Logo. 8.6 For the avoidance of doubt, the Centre acknowledges and agrees that all Certificates must at all times be produced and printed by Qualsafe Awards only, and the Centre shall not attempt to print or issue their own certificates with any Qualsafe Awards branding, logo or other mark of identification (including, without limitation, the Qualsafe Awards Centre Logo). 9.1 The Centre acknowledges and agrees that as part of the Centre Services, Qualsafe Awards shall be entitled to perform audits of, and/or carry out External Quality Assurance visits at, the Centre, including access to its staff (including its Trainers, Assessors and Internal Quality Assurers), its Approved Qualifications and its training venues. 9.2 The Centre agrees and undertakes that it shall provide all reasonable assistance to Qualsafe Awards and/or its nominated External Quality Assurer (“External Quality Assurer”) in respect of an audit, including without limitation providing in a timely manner all documentation requested and access to the Centre’s training venues. 9.3 The Centre undertakes that it shall fully investigate and comply with the complaints procedure as detailed in the Qualsafe Awards Training Commitment, Customer Complaints Policy, Centre Handbook and any other document as may be supplied by Qualsafe Awards from time to time. 9.4 In the event that the Centre notifies Qualsafe Awards of a complaint and/or Qualsafe Awards at any time receives or otherwise becomes aware of a complaint from a third party in relation to the Centre and/or any of its Qualifications, the Centre shall and shall ensure that all its employees and agents (including without limitation Trainers, Assessors and Internal Quality Assurers) shall provide Qualsafe Awards with all assistance and access necessary or desirable to assist Qualsafe Awards to investigate and, where appropriate, deal with the complaint. 9.5 The Centre grants Qualsafe Awards, its External Quality Assurer and other agents and employees an irrevocable licence at any time to enter any premises where the Qualifications are delivered and/or Qualsafe Awards Materials or Evidence are or may be stored in order to inspect them, or, where the Centre has not acquired ownership of the Qualsafe Awards Materials to recover them. 10.1 The Centre undertakes and warrants that it has obtained at its own cost all the necessary permissions, certificates, licences, permits and consents required by statute or any order or regulation made thereunder or by any registration or by-law of any local authority in respect of delivery of the Qualifications, including but not limited to any licences or registrations necessary to comply with the Data Protection Act 2018 and to disclose information concerning the Centre, its Trainers, Assessors, other staff and Learners to Qualsafe Awards, Qualification Regulators and to other Awarding Organisations. 11.1 In the event that the Centre wishes to make any changes to any aspect of the Contract, it must notify Qualsafe Awards of such changes in writing (“Change Request”). 11.2 On receipt of a Change Request Qualsafe Awards will, within 14 days, notify the Centre in writing as to whether it accepts the Change Request and if it is willing to accept the Change Request will notify the Centre of the increase or decrease of the cost and the relevant changes that need to be made to the Contract. Qualsafe Awards is under no obligation to accept any changes. 12.1 This Condition 12 sets out the entire financial liability of Qualsafe Awards (including any liability for the acts or omissions of its employees, agents and sub-contractors) to the Centre in respect of: any breach of the Contract; any use made by the Centre of the Centre Services, including without limitation Qualsafe Awards Materials; any use made or supply onwards by the Centre of any Qualsafe Awards Materials; and any representation, statement or tortious act or omission (including negligence) arising under or in connection with the Contract. 12.2 Nothing in these Conditions limits or excludes the liability of Qualsafe Awards for: death or personal injury resulting from Qualsafe Awards’ negligence; or for any damage or liability incurred by the Centre as a result of fraud or fraudulent misrepresentation by Qualsafe Awards. 12.3 Except as set out in these Terms and Conditions all warranties, conditions and other terms implied by statute or common law are, to the fullest extent permitted by law, excluded from the Contract. Qualsafe Awards shall not be liable to the Customer whether in contract, tort (including negligence) or otherwise for any loss of profit; anticipated profits; revenues; anticipated savings; goodwill or business opportunity; or for any indirect or consequential loss or damage whatsoever or for any failure to comply with its obligations due to an event beyond Qualsafe Awards’ reasonable control. Qualsafe Awards’ aggregate liability to the Customer whether in contract, tort (including negligence) or otherwise shall in no circumstances exceed the total sum paid or payable by the Customer to Qualsafe Awards under the Contract. 13.1 The Centre shall at all times keep secret and confidential all Intellectual Property and technical or commercial know-how, specifications, inventions, processes, initiatives, business and trade secrets, methods of doing business, customer lists and all other information of a confidential nature (including without limitation the Qualsafe Awards Materials and Qualification assessment papers) which have been disclosed to the Centre or the Centre’s employees, agent or other representatives (including without limitation Trainers and/or Assessors) by Qualsafe Awards, its employees, agents or sub-contractors and any other confidential information concerning Qualsafe Awards’ business or its products which the Centre may obtain. The Centre shall restrict disclosure of such confidential material to such of its employees, agents, third parties or sub-contractors as need to know the same for the purpose of discharging the Centre’s obligations to Qualsafe Awards, and shall ensure that such employees, agents or sub-contractors are subject to obligations of confidentiality corresponding to those which bind the Centre. 13.3 This Condition 13 shall survive termination of the Contract, however arising. 13.4 The Centre shall indemnify Qualsafe Awards and keep it fully indemnified in respect of any loss, cost, claim, damages and/or expense incurred by Qualsafe Awards in connection with any breach of Condition 13 by the Centre and/or any of the Centre’s employees, agents or other representatives (including without limitation its Trainers and Assessors), in whole or in part. c) if the other party becomes bankrupt, insolvent, compounds with its creditors or shall have distress or execution levied upon its property or is wound up or goes into liquidation (except for the purposes of a bona fide reconstruction) or shall have a receiver, administrative receiver or administrator appointed of the whole or any part of its assets or shall suffer the appointment of any similar person under the laws of its domicile. iv) is, in Qualsafe Award’s reasonable opinion, carrying out any act or making any omission which damages or brings Qualsafe Awards’ reputation into disrepute. 14.3 Following the expiry or termination of this Contract for any reason: should Qualsafe Awards discover that any Qualsafe Awards Certificates have been wrongly issued to Learners (whether by reason of the Trainer and/or Assessor not being Approved or otherwise), the Centre shall comply with Qualsafe Awards’ requests to rectify such incorrect certificates, including but not limited to providing the contact details for any relevant Learners, shall retain copies of all records and materials relating to its rights and obligations under the Contract (including without limitation Learner records but excluding any Qualsafe Awards Materials) (“Centre Records”) for a period of three years and shall provide Qualsafe Awards with copies of the Centre Records on request. The Centre shall also provide such further information and undertake such additional steps as Qualsafe Awards requests to ensure it is able to comply with the requirements of the Qualification Regulators. 15.1 Each provision of the Contract is severable and distinct from the others and if any provision is or at any time becomes to any extent or in any circumstances invalid, illegal or unenforceable for any reason, it shall to that extent or in those circumstances be deemed not to form part of the Contract, but the validity, legality and enforceability of all other provisions of the Contract shall not otherwise be affected or impaired, it being the Parties’ intention that every provision of the Contract shall be and remain valid and enforceable to the fullest extent permitted by law. 15.2 Qualsafe Awards shall have no liability to the Centre under the Contract if it is prevented from, or delayed in performing, any of its obligations under the Contract or from carrying on its business by acts, events, omissions or accidents beyond its reasonable control, including strikes, lock-outs or other industrial disputes (whether involving the workforce of Qualsafe Awards or any other party), failure of a utility service or transport network, act of God, act of terrorism, war, riot, civil commotion, malicious damage, compliance with any law or governmental order, rule, regulation or direction, accident, breakdown of plant or machinery, fire, flood, storm or default of Qualsafe Awards’ or sub-contractors. 15.3 Failure or delay of a party to exercise or enforce any right under the Contract shall not be deemed to be a waiver of that right or any other right, nor operate to bar exercise or enforcement of it or any other right at any time or times thereafter. 15.4 Each party warrants to the other that the Contract and the Centre Agreement constitute the entire agreement and understanding between the parties and supersedes any previous agreement between them relating to the matters contained in them (which shall be deemed to have been terminated by mutual consent). Further, in entering into the Contract and the Centre Agreement, each party confirms that it does not rely on any statement, representation, assurance, promise or warranty of any person (whether a party to this agreement or not) other than as expressly set out in the Contract and the Centre Agreement. Neither party excludes its liability for fraud or fraudulent misrepresentation. 15.5 A person who is not a party to the Contract has no right under the Contracts (Rights of Third Parties) Act 1999 to enforce any terms of the Contract. 15.6 The Centre warrants to Qualsafe Awards that it has full power and authority under its constitution, and has taken all necessary actions and obtained all authorisations, licences, consents and approvals, to allow it to enter into this Contract. 15.7 The Contract shall be governed by and construed in accordance with English law and the courts of England and Wales shall have exclusive jurisdiction to settle any disputes which may arise out of or in connection with the Contract.